Once there was a coffee shop near the mountain area where you'll see dried Eucalyptus leaves are scattered. Every morning, the cleaning service gather all these leaves and put them into the garbage bag and burn them. 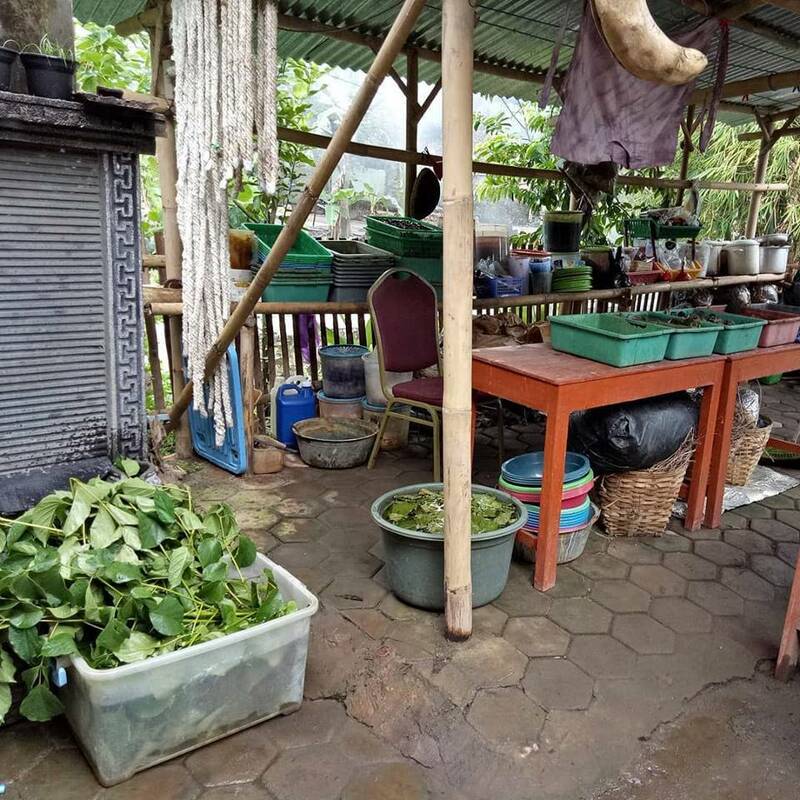 Narsih Setyawan, also known as Awang Kagunan, has a different way of dealing with the unused dried leaves. She turned those dried leaves into something valuable. As a modern woman who is always up to date with the latest fashion trends, she aims to produce comfort clothes for Muslimah women. I was given the opportunity to meet with her just a couple of weeks ago Yogyakarta and she told me that she is working towards creating something natural and different for Muslimah. Bunda Awang, a woman with one child found a new technique for cloth coloring. She dipped the cloth using dye from the scattered leaves. In 2015, Awang Kagunan saw her neighbor cutting down a bamboo tree. So she decided to ask for some (Bamboo leaves). She applied her new method onto a fresh piece of cloth. The result turned out amazing since the color was so natural and so abstract. Focused on the new found method, Awang Kagunan went on to test on the quality of the color whether it will fade or not. She soaked the colored cloth in water for three days. Surprisingly, the color and style of the leaves are completely imprinted on the cloth. From that day, this new method has been named as the ‘Ecoprint’ technique. 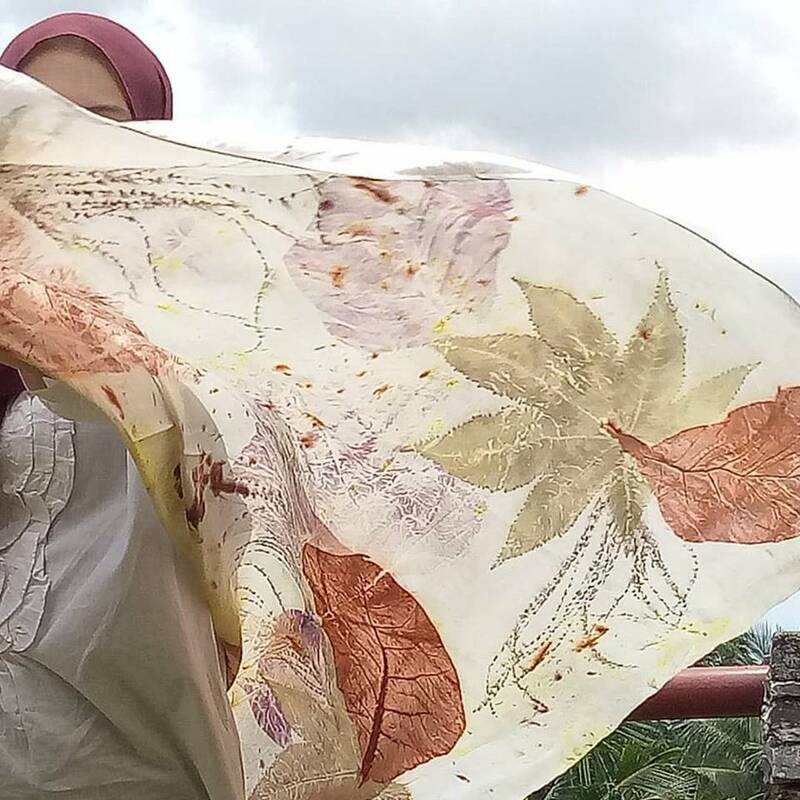 Awang Kagunan believes every leaf has its own theme and style when applied to the cloth. She explored this with other types of leaves to develop different themes. Based on her experience, the best leaves for the Ecoprint technique boils down to the Eucalyptus, Yellow Teak, and Mahogany leaves. Bale Kagunan Studio was established in 2016. Awang Kagunan believes that her findings can help others develop as well. 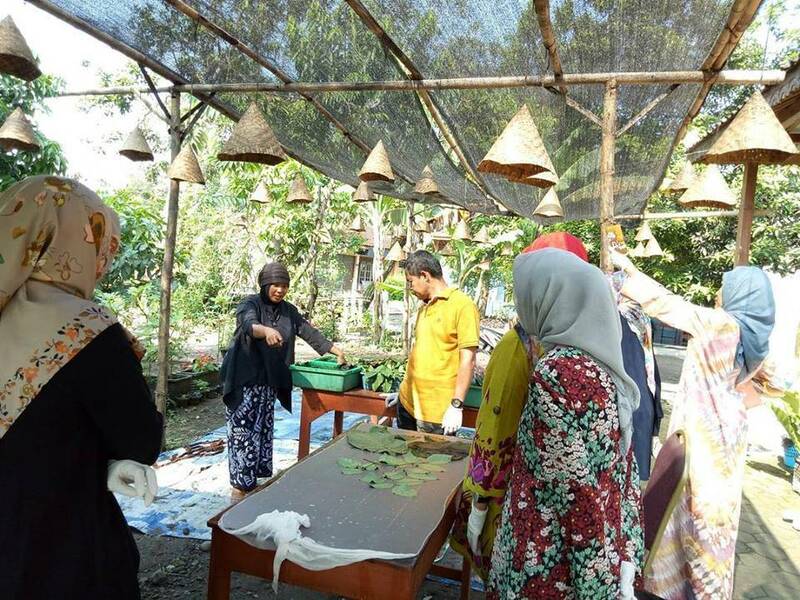 As a Muslimah, she wants her community and people to develop their own life skills. She organized a workshop for anyone who has an interest in fashion. Complete with a detailed training on the Ecoprint method for the art lover, the crafter, women, men, students and many more. Awang Kagunan is not only training them on the technical skills in cloth painting but also supporting and motivating them at the same time. She motivates her students to venture in similar goals such as coming up with their very own start-ups. 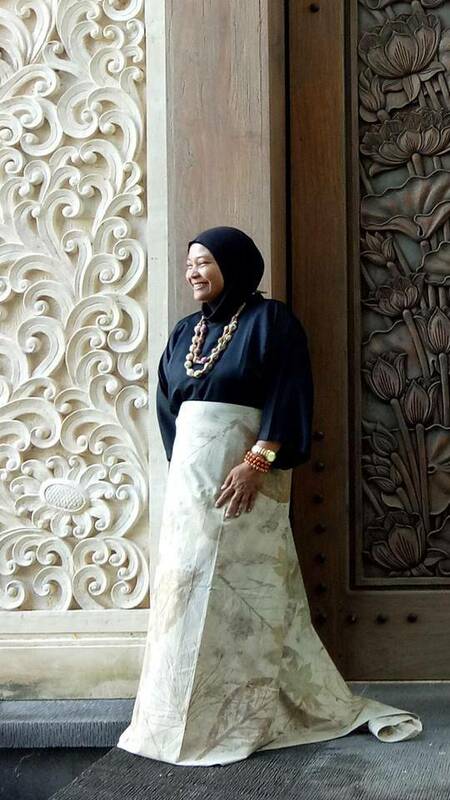 Surely in business, there is competition, but Awang Kagunan does not want to treat her students as her rivals or competitors. She is pretty confident that her students will be able develop beyond her expectations. The Fashion industry will never come to a stop. Awang Kagunan realizes that situation. In her Bale Kagunan Studio, she is always researching and developing on new models. The Ecoprint method then becomes a promising job. 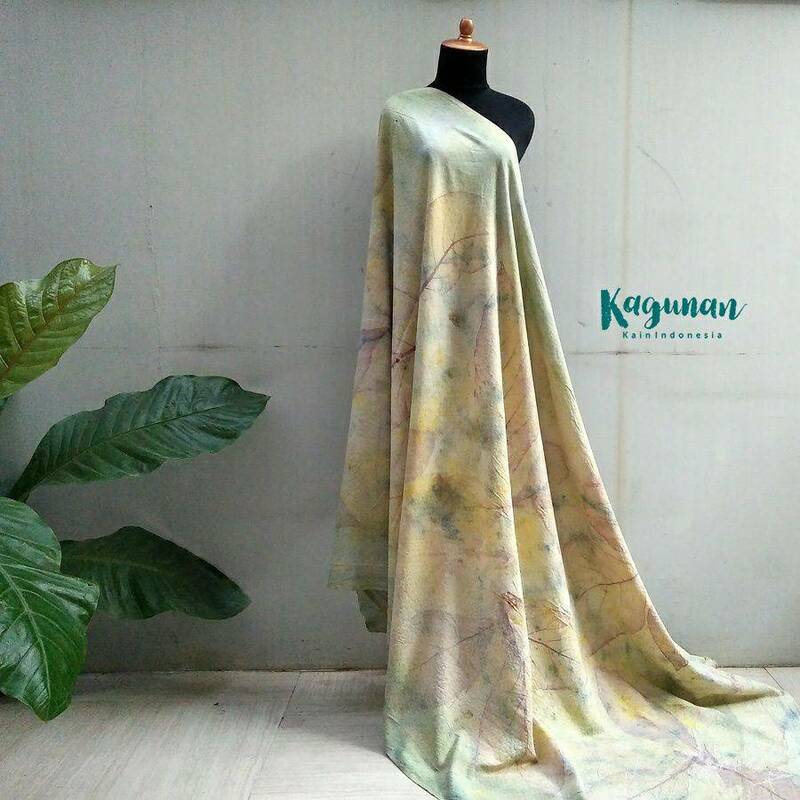 Today, she has produced many Ecoprint works, printed on raw cloth, scarf, and pashmina. She is really delighted with her Ecoprint work since she used natural and eco-friendly natural dye. People from Jakarta and Central Java are really interested in her work. 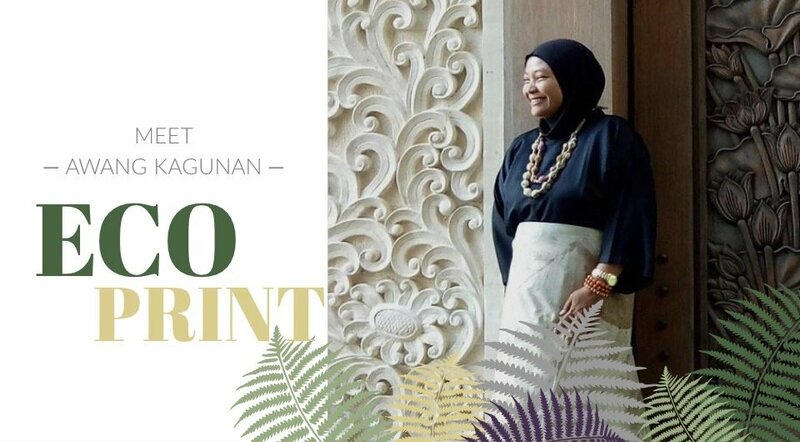 She has her own brand name called Kagunan Ecoprint and Natural Dye. 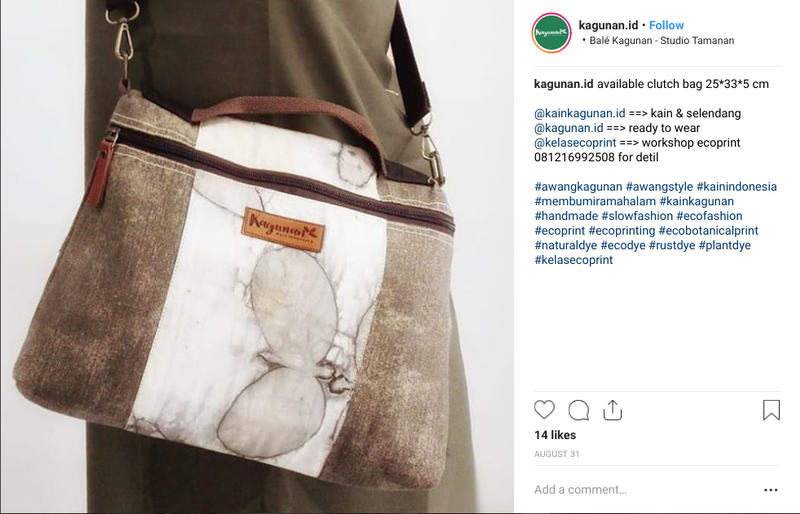 Kagunan Ecoprint and Natural Dye have its own Facebook and Instagram accounts. People often visit both social media accounts to check the latest update of her products. The range price for her products starts from IDR 200,000 to IDR 800,000. Awang Kagunan also mentioned that the hardest part of her job is generating the idea. Be creative and never end to develop the products are her tips for us! If you want to learn a new skill in the fashion industry, it is definitely worth a visit Bale Kagunan.